We glad to announce grafana-datasource-plugin-groonga 0.1.0 release. It's the first release of grafana-datasource-plugin-groonga. 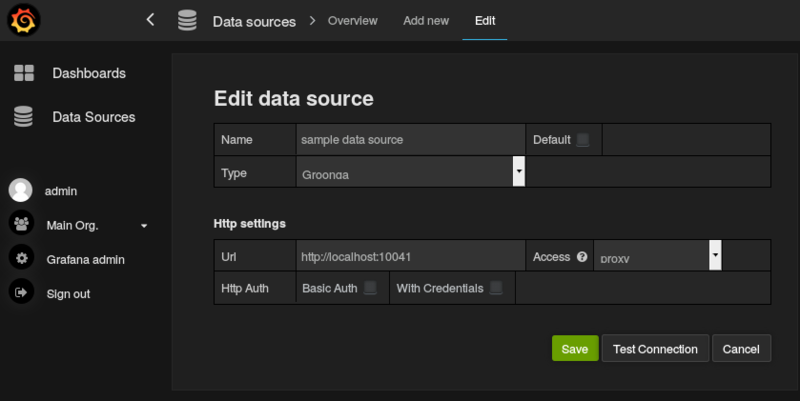 grafana-datasource-plugin-groonga is a plugin for Grafana that adds a datasource for Groonga. It makes to be able to visualize data of Groonga easily. Visualize numeric column data of a table that contains Time type column. Require Time type column in data because this plugin shows data in time series. Except for numeric type columns are not covered because they are not statistical information. Now, this plugin has only the above features. For example, you can visualize specific column data transition in a table that contains logs of every fixed time. Visualize multiple columns in a graph. The above features will be supported in a future release. Copy a Git repository or archive of grafana-datasource-plugin-groonga into plugins directory in Grafana. Then, restart Grafana server. See README in more details. 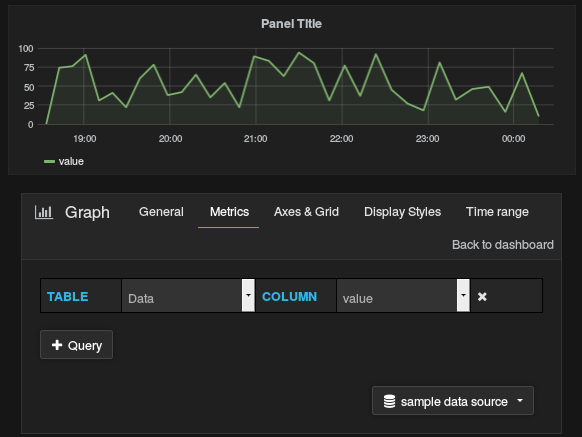 First, add this datasource like the following screenshot in administration view of Grafana. The following case specifies a Groonga server running on http://localhost:10041. Next, add graph on dashboard, and configure metrics like the following screenshot. It's an example for the graph which contains a numeric value column of Data table that has Time type column. We welcome your feedback via Groonga-talk mailing list or GitHub Issues. Feel free to report your feedback. We announced that the first version of grafana-datasource-plugin-groonga has been released. Let's visualize Groonga's data with the new Grafina data source!